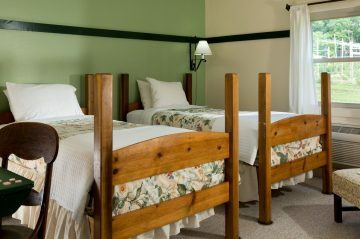 The Inn at Cedar Falls is a Hocking Hills bed and breakfast in Logan, Ohio. We are proud to be a Select Registry member and we promise a satisfying bed and breakfast experience you’ll cherish forever. 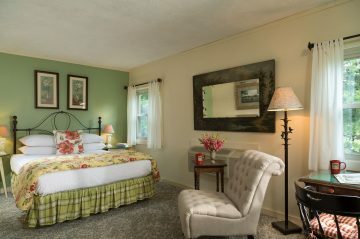 Each is furnished with a queen-size bed or two twin beds, under counter refrigerator, a writing desk, and is highlighted with country antiques. 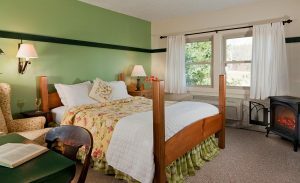 All of the rooms in our bed and breakfast have carpet, a private bath, and individualized heating and air-conditioning units. Our Hocking Hills bed and breakfast guests receive complimentary coffee and fine toiletries like soap, lip balm, and lotion. Plush robes, hair dryers, irons, and ironing boards are also provided for guest use. After a long drive in, mouth-watering cookies await you. Our common room is the perfect place to meet other inn guests, read a book, play cards, or sit by the wood-burning stove. Rocking chairs line the first and second-floor verandas that overlook the garden. Click here to see a map of the grounds.